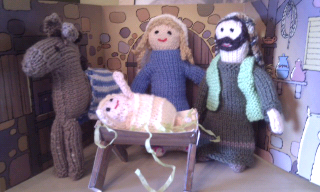 Crafty escapism: Knitivity stable complete. Da Darh! So happy. After much thought I nailed it. The log cabin just wasn't the thing. 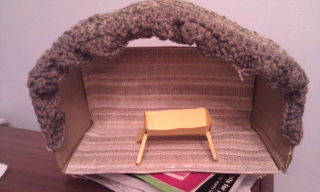 Looked at Google images for knitted nativities and worked out I needed a box without a lid on its side with an open top and a upside v shaped cardboard roof. Once I assembled this I covered the floor and inside back wall in rustic wallpaper remnants and crocheted a mossy roof with three colours of yarn together. Made a tiny crib out of yellow card and its done. My mum will be more than delighted! A close friend on seeing it said she would cry if someone had given her it! Still very much enjoying out own knitivity! Have now moved on to the crocheted finger penguin puppets. Initial go was massive more like a mitten than a finger puppet but #2 seems more snug. Must find a way to post photos on this blog!